An extraordinary aspect to wildlife management these days is the extent to which technology is being used to learn more about animals. It seems telemetry, the process of using tracking devices attached to the animals to collect data, is increasingly being used to monitor a variety of species. In my time with the Game and Parks Commission, I’ve photographed researchers putting collars on animals as big as elk and as small as burrowing owls. I even read an article not long ago about how scientists are using telemetry to study the movement of housecats to see what mischief Jinxy gets into when away from the house. So, I shouldn’t have been surprised to get an invitation from Commission fisheries biologist Zac Brashears to photograph a project using telemetry to track a species that, right or wrong, doesn’t make a lot of headlines – the common carp. But, I was. After all, why would someone want to track a maligned “rough fish” such as a carp? Wouldn’t most of us rather know where the big bass and pike are hanging out? I guess that would be cheating. In this case, tracking carp makes a lot of sense. Carp aren’t native to Nebraska and are not prized by most anglers. Regardless of how fun they are to catch, their hog-like presence can pose problems to habitat of other species – certainly no less in a valued natural Sandhills body of water such as Hackberry Lake on the Valentine National Wildlife Refuge. Biologists contend that the big brutes not only challenge other fish species, but also destroy valuable habitat components for waterfowl. That’s why longtime U.S. 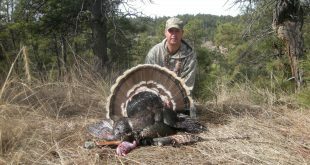 Fish and Wildlife Service refuge manager Mark Lindvall sought and received a Controlling Invasives with Volunteers grant for the project at Hackberry – one of his final projects leading up to his recent retirement. With the funding, volunteers from the Sandhills Prairie Refuge Association are joining staff members of the federal agency and the Nebraska Game and Parks Commission, in studying where the fish are spending their time. By monitoring the fish, they are working to see what percentage of the entire carp population can be later baited into a huge standing net – 70-by-70 feet wide and eight feet tall — and removed. As of now, the carp population in Hackberry isn’t considered large enough to warrant killing off all fish in the lake and starting over, as will soon be the treatment at nearby Rat and Beaver lakes, but it is a problem, nonetheless. The net and transmitters were purchased with funds from the $10,000 grant. The Hackberry project began in earnest during two days in mid-July when crews in Game and Parks electrofishing boats, led by Commission biologists Al Hanson, Brashears and Joe Rydell, captured carp. A total of 15 carp received radio transmitters while another 290 were fin clipped to help the researchers estimate the carp population and the effectiveness of netting. The process of equipping each carp with a radio transmitter, which was handled by University of Nebraska fishery scientist Chris Chizinski and student Nick Cole, involved treatment with anesthesia and cutting an incision on the fish’s underside. Once each fish was properly dazed and cut, researchers put the finger-sized transmitter into the opened belly. With each fish’s measurements recorded, a clipped pelvic fin, and an antenna protruding from its body, it was stitched up and returned to the water. 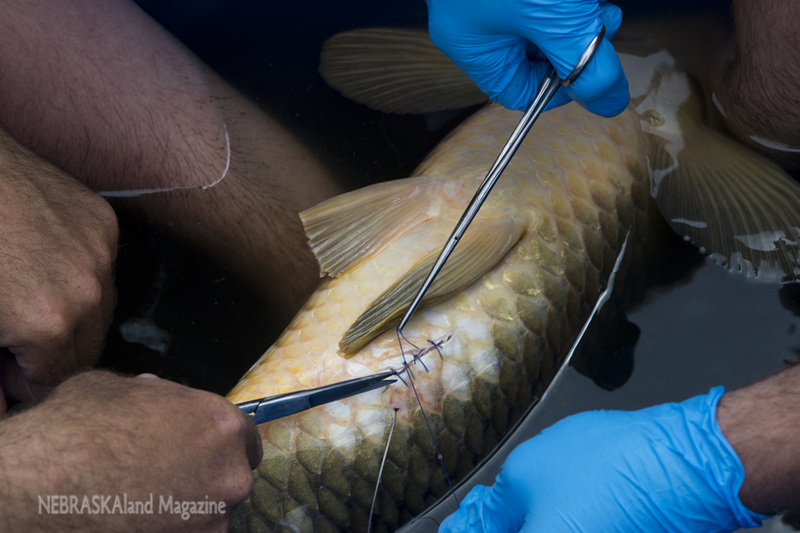 While most fish species would be challenged to survive such an ordeal, the hearty nature of a carp makes it suited to withstand such treatment and they heal quickly. We’ve all likely heard the phrase, “You can’t kill a carp.” Lindvall, who is providing volunteer assistance, said all the radio tagged fish are alive and moving around the lake, some covering quite a bit of territory. The carp with the telemetry units will continue to be tracked year-round, with close monitoring of their activity in winter when the fish are known to congregate in tight groups. The telemetry will help determine if it will be feasible to trap enough carp to make any notable difference. In an ideal ending, from the researchers’ standpoint, all the carp will be removed when the big net is pulled from the icy water. Those involved with the mission admit removal of the total carp population is an unrealistic long shot and surely won’t happen. But, the project will prove to be successful if it provides a notable reduction in the carp population. Many other native species will benefit. What are you supposed to do if you catch one of those hi-tech carp with an antenna protruding from its pelvic area? While you’re encouraged to keep most carp you catch, the researchers ask that you return the tagged fish to the water without harm so it can continue to be monitored. With a little persuasion and good fortune, the fish will join many others caught in the big net this winter. If nothing else, we’ll know a little more about where the carp goes.